Most likely the Chinese authorities are aiming their next punch where it will hurt the most. I sure hope I’m wrong. I hope that cooler heads prevail and a full-blown trade war is averted. I believe if you live long enough you’ll experience history repeating itself. I’m not the oldest dog on the block, but I’ve been around awhile. I can clearly recall January of 1980. I was about 16 months into my first job out of college, managing a grain elevator in southeastern Illinois. My principal task was sourcing corn and soybeans from area producers along with operating a custom grind feed mill. Suddenly and without notice, President Jimmy Carter placed an embargo on grain sales to the Soviet Union. This was a retaliatory response to their invasion of Afghanistan. Jimmy Carter’s embargo was based upon the theory he would starve the citizens of the Soviet Union, bring the country to its knees and force them to withdraw from Afghanistan. History indicates the policy was a disaster. Not only did it not work, but it had far-reaching and unexpected consequences. After the announcement, the Chicago Board of Trade remained closed for a couple of days to allow everyone a chance to “absorb” the news. When the exchange finally opened grain futures were limit down for several days. The Midwestern grain producer suffered greatly, the Soviet Union soon learned they could source grain from South America, they also were forced to begin developing the Ukraine breadbasket and Jimmy Carter was not re-elected as Ronald Reagan walked into the White House. I now ponder the current situation and wonder: is history about to repeat itself? A foreign policy of “shooting from the hip” and ramming tariffs, levies and embargos upon our trading partners has not worked out well in the past and is highly unlikely to work out well in the future. The facts to date are that President Trump is in the process of slapping tariffs on steel and aluminum with the scope of these tariffs aimed directly at China. In addition to the above-mentioned tariffs, Trump is threatening tariffs on $50 billion to $60 billion worth of goods that are imported from China. The dispute with China is concerning the massive trade deficit and Chinese efforts to obtain U.S. technology through intimidation, state financed acquisition and subterfuge. The initial Chinese response has been to slam their own tariffs on approximately $3 billion worth of goods including pork, steel pipes, fruit and wine. The Chinese Commerce Ministry has warned of additional action. Chinese authorities have stated they’re not looking for a trade war but they won’t run from one. As the news was digested by the markets on March 23, stocks closed sharply lower as did lean hog futures. Looking specifically as the Chinese 25% tariff on U.S. pork, it’s my opinion the lean hog futures market is grossly over-reacting to the development. Looking at the facts, last year total Chinese pork imports declined by 9% compared to 2016. In 2017 China imported most of their pork from the European Union. U.S. pork exports to China/Hong Kong last year declined by 18.6%. Yet during this period, U.S. pork exports were up 7.5%. So, total U.S. pork exports have been increasing while total shipments to China have been decreasing. Rapid growth in U.S. pork exports has been occurring to Mexico and the rest of Central America. U.S. pork exports are projected to increase by more than 5% this year. The new tariff imposed by China is not going to change this projection much. The fact is, pork prices in China are currently at four-year lows. China does not need our pork at this time. Projections for Chinese imports continue to decline in the months ahead. U.S. pork export growth is expected to remain intact. Eventually, in my opinion, the lean hog futures market will figure this out and prices likely will bottom and work higher into the summer timeframe. But what is likely to happen next? When Chinese authorities indicate additional measures will be taken, one has to ask what measures? In my opinion the most likely measure would be a blockade against importing U.S. soybeans. This is where I feel that history is about to repeat itself. If this happens, once again the Midwestern grain producer and the Midwestern economy will bear the brunt of the policy. China is, by far, the largest buyer of U.S. soybeans. I’ve heard repeatedly that “China can’t do without U.S. soybeans,” so they would never blockade the importation of U.S. soybeans. This is dangerous logic and likely does not apply to the Chinese government. Consider the following points. • Hit where it will hurt most. • A blockade on U.S. soybeans would likely cause prices in the United States to drop by $1.50 to $2 in rapid fashion. • Feed prices in China would soar. • Livestock (sows) would be liquidated in China. • China would import distiller’s dried grains with solubles in huge quantity. • Eventually China would import increasingly large amounts of pork. • China owns Smithfield, the largest pork producer in the United States. • The Midwestern grain producer would suffer great hardship. • Trump would not be re-elected. • A host of unintended developments and consequences would surface. History has demonstrated that slapping tariffs, levies, embargos and blockades, in a disruption of free trade is simply bad policy. It does not work and typically there are far-reaching and unintended developments and consequences. In my opinion if the Trump administration continues down this path, it’s highly likely that the Chinese will blockade U.S. soybeans. They’ve already hinted at such. Last fall they changed the FM requirement for U.S. soybeans from allowing 2% foreign material to 1%. In addition, they’ve complained to the World Trade Organization that the United States unfairly provides price supports to U.S. producers. The Trump challenge and “American First” attitude is not a surprise to Chinese authorities. One thing about President Trump, everything he said he would do if elected, he’s doing. However, the Chinese know how to play hardball. 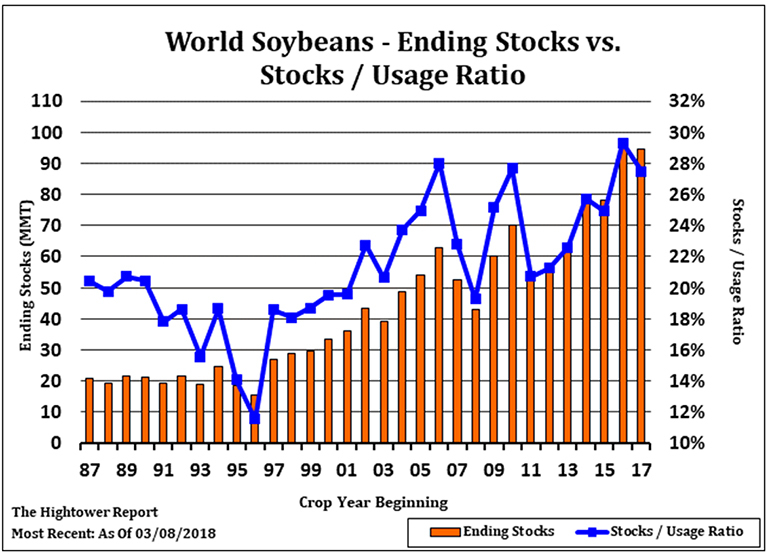 The United States and the world are awash in soybeans. This fact makes soybeans the ideal weapon for the Chinese to use in a trade war. Total production has been exceeding demand. 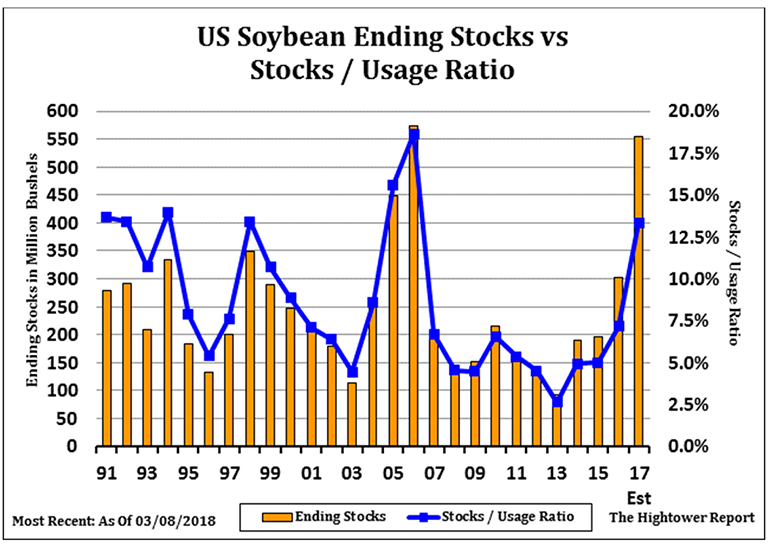 U.S. ending stocks are projected to swell to over 550 million bushels. Export sales and shipments are running below last year. Currently soybean export sales are down 7% compared to this time last year and shipments are down 12%. Currently, the USDA is projecting that soybean exports will decline by 5% this year. Yet, despite these facts, U.S. producers are expected to increase acreage devoted to soybean production this spring to another record high. In addition, world ending stocks are very large by historical standards. Most likely the Chinese authorities are aiming their next punch where it will hurt the most. I sure hope I’m wrong. I hope that cooler heads prevail and a full-blown trade war is averted. A bump in the road or the beginning of a steep hill?